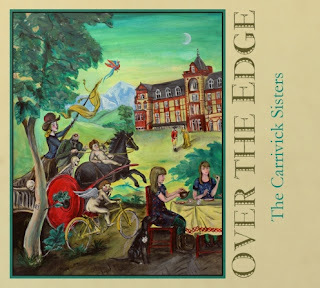 OVER THE EDGE by Devon sibling duo The Carrivick Sisters is an unblemished release that will appeal to both traditional folk fans and those who like their music flavoured with a sprinkling of Appalachia Americana. There could not have been a more appropriately named location for its recording at Pure Records Studio as this is likely to be an aesthetically pleasing record as you’re likely to hear all year. The delectable musicianship melts into the crystal vocals which see both Laura and Charlotte in harmony as well as sharing lead. The stories and tales around this collection of twelve songs have become a central feature of their live shows over the past year so it is good to finally get them attached to a recording to aid their further enjoyment. Having first coming across the duo at the Moseley Folk Festival a couple of years ago, their prodigious talent is now beginning to blossom and this new record, their 5th release, is unrivalled in their back catalogue. Charlotte tends to focus more on the guitar input as well as adding the banjo and mandolin touch while Laura majors on the fiddle with a switch to Dobro on a couple of tracks. The bass of John Breeze backs all tracks while piano, electric guitar and percussion making fleeting appearances. As well as appearing live with the sisters, rising folk star Blair Dunlop adds harmony vocals to a pair of songs including the excellent ballad ‘The Moon’, which forms part of an inspiring album opening. High standards are set right from the off when the girls put to song a true tale of an ultimately futile protest against the building of the Headland Hotel in Newquay back in the 1890s. The top quality song writing in this cleverly titled number ‘Over the Edge’ is a recurring theme throughout the album which sees the sisters, either solo or in tandem, pen the lyrics to nine of the twelve tracks as well as composing the two instrumentals ‘Making Horses’ and ‘Slap on Eleven’. The sole traditional offering is ‘Pretty Fair Damsel’, their take on an old American song. Like all good song writing albums should have, a lyric sheet accompanies the CD and the press release includes a very informative song-by-song background analysis from the girls which enhances the listening experience and may have even have found a useful home within the package itself. The appreciation of the Carrivick Sisters extends from the vocals, music and lyrics to the background and influence of their craft as well as the evolving live experience which continues to develop progressively. As far as the stand out track is concerned, the superb ‘Outside Time/Salamander’ makes a strong case with a vibrant fiddle piece tagged onto the end but is shaded by the enchanting ‘If You Asked Me’ which features early in the album. This wonderfully constructed up tempo song deals with the realistic side of love and its sound and style is very reminiscent of The Good Lovelies in full flow. 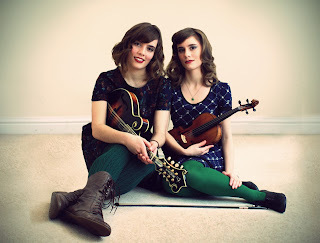 Although the Carrivick Sisters are regularly active on the live circuit, their planned shows will no doubt feature this October 7th release up to the end of that month and no doubt beyond OVER THE EDGE has the quality to reach out to a wide audience and highlight why the Carrivick Sisters are great ambassadors for roots music originating from both sides of the Atlantic.